If Luke Wade is trying to seduce the audience, it’s mission accomplished. The coaches are blown away by Luke’s twist on the soul classic “Hashtag Luke-ify” says Pharrell. 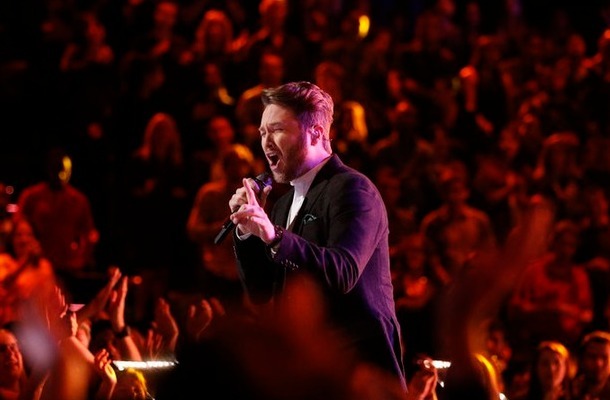 In the first night of season 7 of “The Voice” Live Playoffs, Team Blake and Team Adam performed. In the second night new coaches Team Gwen and Team Pharrell members performed on this Veterans Day show. Their teams are fighting to gain a spot in the Top 12. Only three artists from each team will move-on. The official Voice App allows viewers to vote via their smart phones. Host, Carson Daly stated that the show had record voting in their first night of Live Playoffs. Seven-time Grammy Award winner Pharrell Williams opened the show by performing his hit single “Hunter” on The Voice stage. Pharrell struts out, accompanied by sprite-like dancers in floral body suits. The first contestant is Team Gwen’s Ryan Sill, performing One Republic’s “I Lived,” an uplifting anthem that matches his positive nature. In new rock star duds, Ryan takes to the stage and immediately has the crowd clapping. Turning up his boy band appeal, he throws out a few sultry looks and killer high notes and now the crowd is cheering. Adam commends him on his perfect pitch and Pharrell thinks he’s really broken out of his shell and Gwen loves Ryan’s infectious positivity. Up next is Team Pharrell Jean Kelley singing Brenda Russell’s 1980s hit, “Piano In The Dark.” Jean dives right into the song, losing herself, and delivering an emotional performance. The coaches all agree that at times her flair for drama overwhelms her vocals, but Pharrell points out that this is just the beginning for her. On to the next performer, Team Pharrell’s Elyjuh Rene singing Sam Smith’s “Latch.” Elyjuh starts acoustically, showcasing his soulful voice, then shifts into high gear as the dance beat kicks in for an electrifying ending that earns him a four-chair standing ovation from the coaches. Adam is practically speechless and thinks Elyjuh is the front-runner on Pharrell’s team and Pharrell couldn’t be prouder. Next up is Team Gwen’s Bryana Salaz singing Five Seconds Of Summer’s “Amnesia.” Gwen had advised Bryana to tap into the emotion of the song and she takes the advice to heart. Her vulnerability definitely comes through on stage and she becomes emotional when she sees her father in the audience. The coaches shower the young singer with praise. And now from Team Pharrell is Luke Wade singing Marvin Gaye’s “Let’s Get It On.” In an effortless performance, Luke saunters across the stage kissing the hands of audience members, and then drops to his knees for an awesome high note and the coaches are blown away “Hashtag Luke-ify” says Pharrell. Team Gwen’s Anita Antoinette singing Meghan Trainor’s “All About That Bass,” with a cool kaleidoscope of colors behind her, Anita shows off her Jamaican charm. “Who are you and what have you done with Anita?” asks Adam. Blake agrees – it’s hard to believe she ever had stage jitters. Pharrell glows with pride, and Gwen loves Anita’s infectious personality. Team Pharrell’s DaNica Shirey singing Joni Mitchell’s “Help Me.” DaNica puts on a flawless performance of this very challenging song. While Gwen isn’t expecting to love the performance because Joni is her hero, but DaNica more than does the song justice, infusing the song with rhythm and energy beyond its original reading. Adam, also a fan of the song, is impressed by DaNica’s personal flourishes. “You just turned Joni Mitchell into Chaka Khan!” he exclaims and Pharrell agrees. Next up we pour a little sugar on THE VOICE with Team Pharrell’s Sugar Joans singing Aretha Franklin’”s I Say a Little Prayer” with a trio of backup singers, Sugar is a throwback to ’60’s soul. Gwen says Sugar’s performance is perfection. “You took us to church,” adds Adam; Blake compliments her unique sound and amazing vibrato. “You just took us on a nice emotional roller coaster ride,” says Pharrell, beaming with pride for yet another member of his team. Now it’s time for Team Gwen’s Ricky Manning singing Sam Smith’s “Lay Me Down.” Ricky delivers an intense, heartfelt performance, punctuated by a stellar bridge. The coaches all agree that Ricky has come a long way and it’s clear he’s in it to win it. The final live playoff artist is Team Gwen’s Taylor John Williams singing Stealers Wheel’s “Stuck In The Middle.” Adam is surprised and impressed by Taylor’s modern take on the rock classic. Blake reveals that the song usually reminds him of an old underwear commercial, but not tonight. After laughing at the underwear comment, Pharrell compares Taylor John to Terence Trent D’Arby.